Cheetah is the undisputed king of the jungle when it comes to speed, holding nature’s land speed record for 10 million years! It is the fastest land animal in the world and it is known to clock 75mph (120 km/h) when it hunts on its prey. Having a phenomenal top speed, its acceleration is what is truly impressive as it can go from 0 to 60mph in 3 seconds or just three strides! This is better than most cars including Ferrari, Lamborghini and the McLaren. Having a small head, slender body and its long and powerful legs, no wonder this beast is known for its speed. It is one of the best land animals in the world. Being native only to North America, it is one of the fastest animals when it comes to long distances. Its top speed can be up to 61mph and it is known to run at 35 mph for 4 miles straight! It has a large heart and a large lung capacity which allows them to sustain this speed for miles together. The Pronghorn is actually faster than any of its potential predators in North America. It is one of the most popular grassland animals in the world. A medium size species of Gazelle, commonly found in the arid regions of South and Southwestern Africa, Springboks are not only extremely agile animals, but also incredible jumpers. They are known to leap up to 4m in the air and jump up to 15m in length in one single stride! They can also run at a speed of around 60-65mph. These attributes of a Springbok come in real handy when they have to evade lions whose favourite food they are. The American Quarter Horse or simple Quarter Horse is an American breed of horse whose speciality is in sprinting short distances. You wonder why ‘Quarter Horse’? It got its special name due to the fact that it can outrun all the other horse breeds in a race of a quarter mile or less. These horses have been clocked at speeds up to 55mph (88.5 km/h). The American Quarter Horse is also the most popular breed of horse in the United States today. Wildebeests are large antelopes native to Africa. These mammals are especially known for their migrations during the dry seasons in Africa. Apart from that, these species are energetic and are also widely known for their speed. 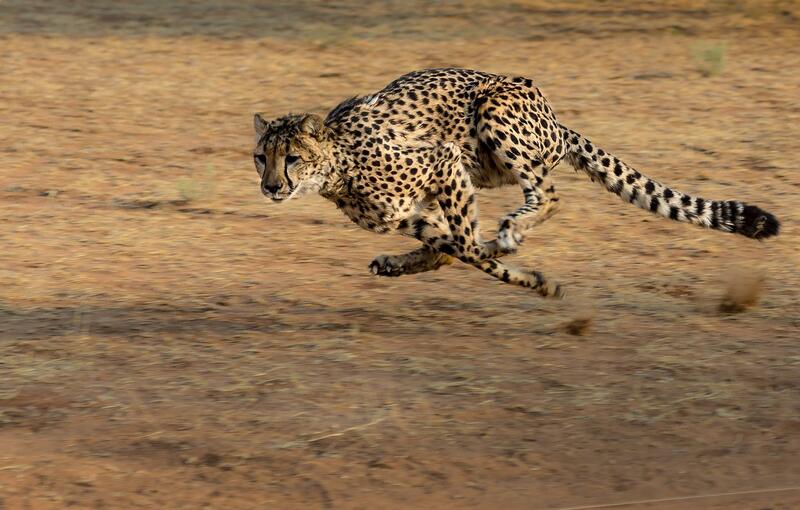 Speed is most crucial in the wilderness for these large beasts because they have to outrun their predators like cheetahs, hyenas and lions among others. During a run, Wildebeests are known to run up to 50mph. But unfortunately for them, lions can run at the same speed as well and to avoid getting themselves killed, they always move in large herds to protect each other. Lions are the second largest cat species in the world and if that is not quite enough, combine it with intense pace and stealth and now you have the KING of the jungle. Lions are known to hunt in groups called ‘pride’. Each pride consists of 10-30 members. Lions can run up to 50mph (80km/h). Along with their ferociousness, stealth and bursts of speed lions have a high success rate of hunting down their predators. It is also one of the loudest animals in the world. Native to Indian grasslands and open woodlands, Blackbucks got their names because the bucks (or the males) turned black as they aged. The males are also famous because of they’re long, spiralled horns. Blackbuck antelopes can also reach speeds up to 50mph but this top speed can be sustained for only about a mile or so. Therefore, their primary weapon is speed and it is used to get away from predators. Greyhounds are the fastest dog breeds in the world and because of this dog breed is used in hunting and in dog racing. They are sigh hounds which means that they hunt by keeping their prey in sight, unlike the bloodhounds who hunt more based on their hearing and smell. Their long, lean bodies, muscular, strong legs and flexible spine help them attain speeds around 45mph (74km/h). But besides all these, greyhounds are known to have a composed and friendly nature. Also, read about biggest dog breeds in the world. Despite its name, Jackrabbit is actually a hare found in the western parts of North America. Jackrabbits have strong and powerful hind legs which not only allow them to run fast but also leap high in the air as well. They can leap up to 6m or 20ft. in a single bound. They can also attain a top speed of up to 45mph (74km/h) when they are hunted by their predators. A combination of this speed, zigzag manner running and incredible leaps help them in outrunning their predators and surviving in the wild. Native to Africa and also being the only bird to make this countdown of the fastest land animals, the Ostrich gets around to different places by running instead of flying. Ostrich buries its head in sand when it is afraid is one of the most common myths about animals. It is the largest and heaviest living bird. When threatened. They often evade their predators by running with the help of those long, powerful limbs but when threatened they can stand their ground and defend themselves with kicks from their strong legs. While running, these flightless birds can reach up to a top speed of 44mph (70km\h). It is also listed as one of the strange animals found only in Africa. There are other animals like elks, kangaroos, African Wild Dogs and Coyotes who come very close but do not make the cut and the above list is the top ten fastest land animals on the planet.